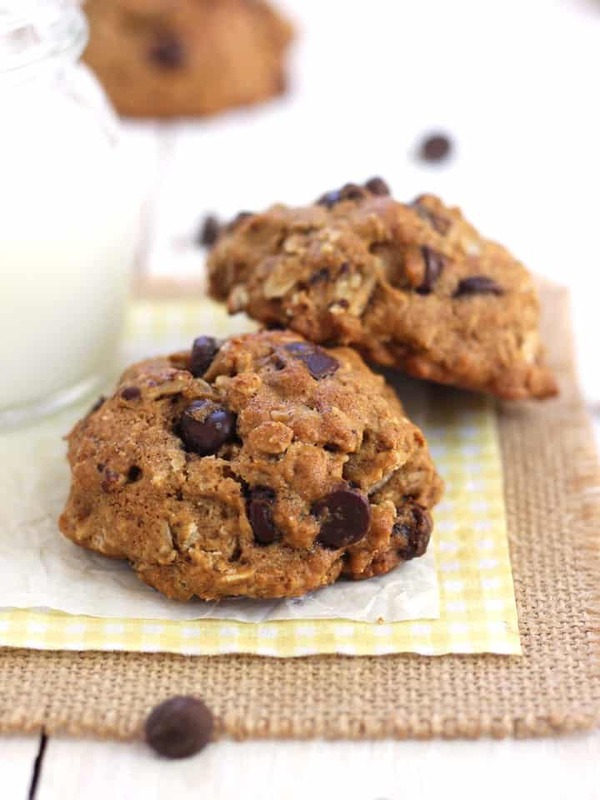 Chocolate Chip Pecan Oatmeal Cookies, super satisfying toaster oven cookies made with whole grains, rich chocolate chips and toasted pecan pieces. See last month our growing list of Toaster Oven Cookie Recipes became the most popular page on the website unseating the always reliable baked potato. Since we know you like cookies and one of us really likes eating batches of test cookies 🙂 we’ve decided to create a new toaster oven cookie recipe every month, Yay! 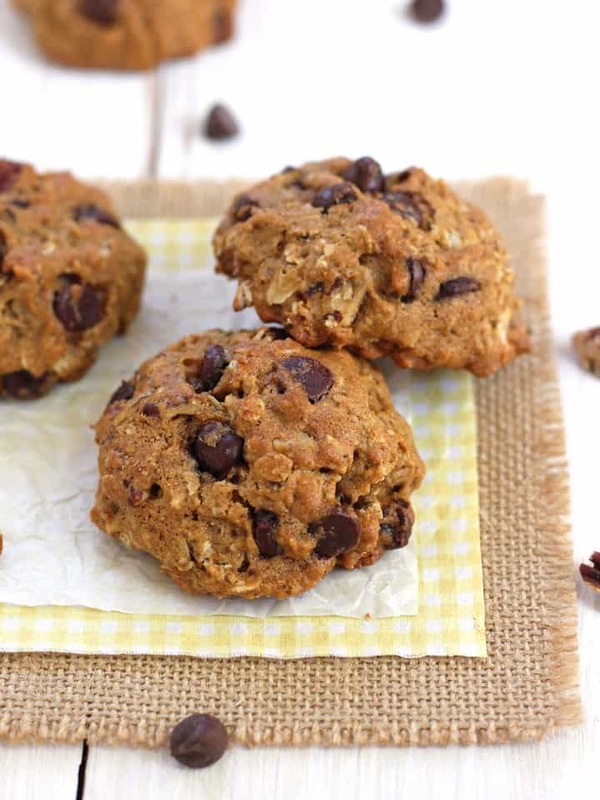 Toaster Oven Love already has recipes for splurge-worthy Double Chocolate Chip Cookies, lighter Cranberry Orange Oatmeal Cookies and a few über-healthy fruit + oat “cookies” like these Strawberry Clementine Cookies. What we need to know is what other kinds of cookies do you want to bake in your toaster oven? Our goal is for Toaster Oven Love to always have great recipes that fit your toaster oven cooking desires. 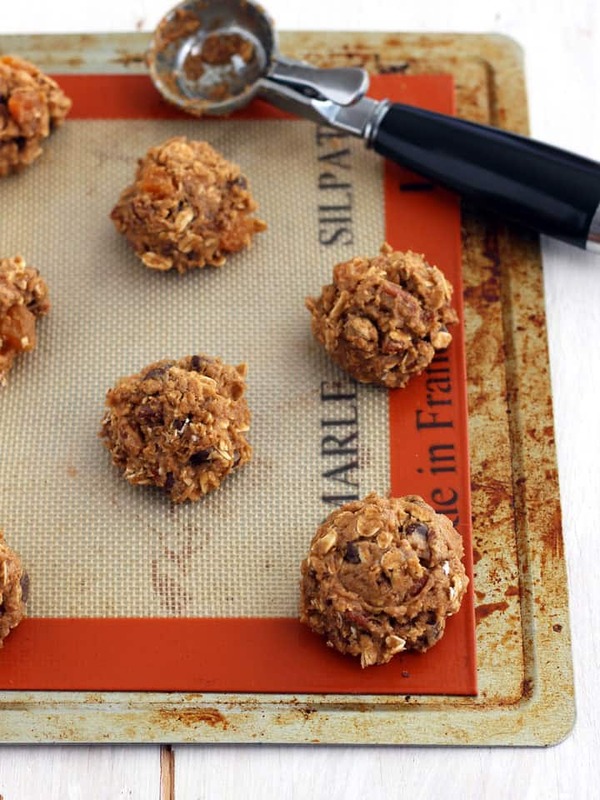 So, we thought you could help us do that by picking next month’s cookie recipe! This month’s poll will close in two weeks on August 10th. The poll has officially closed! It was a close race but in the end Mini Lemon Lime Coconut Sugar Cookies came out on top capturing 42% of the vote. 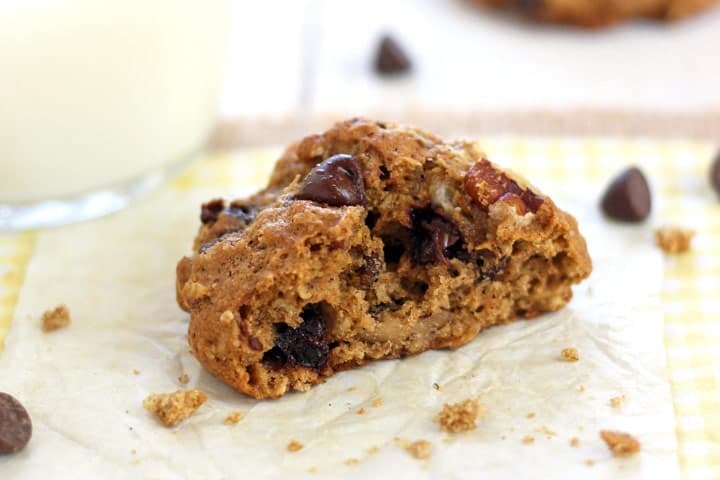 Now about these deliciously crispy on the outside chewy on the inside addictive chocolate chip pecan cookies! 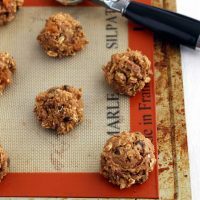 And you can easily substitute any of your favorite oatmeal cookie mix-in’s like dried apricots (I tossed a few in the batch below), peanut butter chips, or chopped almonds. In toaster oven terms they’re on the larger side (about 2 tablespoons each). We used a medium ice cream scoop to portion them. If your cookie sheet is a little hammered like ours you might want to treat yourself to a toaster oven-sized silicone baking mat. Two quick things…first the recipe calls for just half of a well-beaten large egg (1 tablespoon + 1 ½ teaspoons). What to do with the rest of the egg? 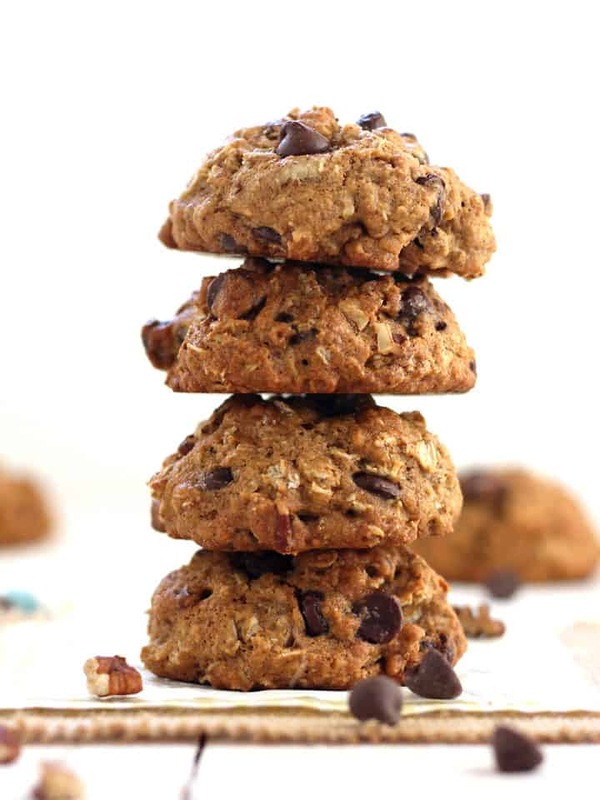 You can store it in the fridge for up to 24 hours, throw it in a skillet with veggies for a quick snack or my favorite option make another batch of these yummy cookies. The second snag is that the cookies taste best if the dough has been chilled for at least 30 minutes. But we want cookies now! Super satisfying toaster oven cookies made with whole grains, semi-sweet chocolate chips and toasted pecans. Spread pecan pieces on a cookie sheet and cook for 5 to 6 minutes until golden and fragrant. Set nuts aside to cool and turn off toaster oven. In a medium bowl use a hand mixer to beat the butter and brown sugar until light and fluffy. Beat in egg, vanilla and apple sauce until combined. Sprinkle flour over mixture, then cinnamon, baking soda, baking powder and salt. On low speed beat just until combined. Stir in oats, chocolate chips and cooled pecan pieces. Chill cookie dough in the refrigerator for at least 30 minutes. When ready to bake, preheat the toaster oven to 375 F and line your cookie sheet with a silicone baking mat or lightly grease it. Drop dough into 9 mounds that are about 2 tablespoons each, at least 2 inches apart (the cookies will spread while baking) onto the prepared cookie sheet. Bake for 13 to 15 minutes until lightly browned and golden. Let cool at least 5 minutes on the cookie sheet and then transfer to a baking rack to cool completely. **To measure the egg, crack your large egg into a small bowl (use a bowl that has a lid for easily storing the leftover egg). Beat the egg with a fork or small whisk just until blended, about 20 to 30 seconds. Measure out the egg required for the recipe and store leftover egg in the fridge for up to 24 hours. Prep Time includes 30 minutes of inactive time chilling the cookie dough. 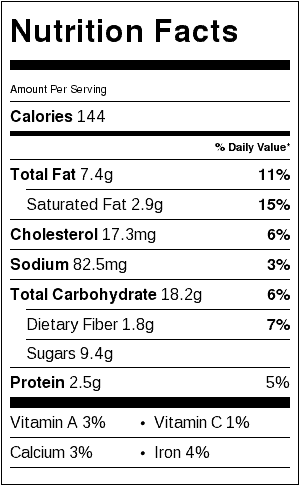 Nutritional Information is an estimate for one cookie. Love this cookie combo! I’m all about the whole grains, and of course chocolate anything. Plus pecans? Yes!! Need a couple of these asap 🙂 And while I did vote, man, it’s not easy having to choose a cookie! Glad to hear you’ll be bringing new ones to us every month! Yum! Fun idea! I voted for the mini lime coconut cookies, I hope you make them! The chocolate chip pecan ones look delicious, I’d love some. Yay thanks for voting Adina! I’ve actually made that recipe 3 times in the last few weeks and all of the cookies have quickly disappeared so I know it’s a winner even if it’s not “the winner” 🙂 I’m planning to post the losing recipes later for sure. yasss what a dreamy combination! Haha 🙂 thanks Anne I used to hate nuts in cookies but I have totally seen the light!